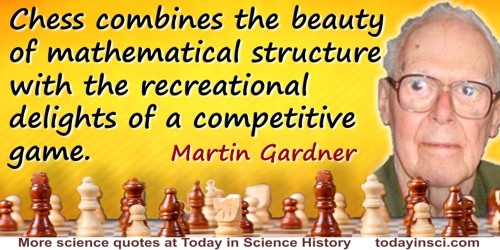 Chess combines the beauty of mathematical structure with the recreational delights of a competitive game. In 'Preface', Mathematics, Magic, and Mystery (1956), ix. Nature, who is a great economist, converts the recreation of one animal to the support of another. In Letter VII, to Thomas Pennant, in The Natural History of Selborne (1789), 35. One of Euler’s main recreations was music, and by cultivating it he brought with it all his geometrical spirit; … he rested his serious researches and composed his Essay of a New Theory of Music, published in 1739; a book full of new ideas presented in a new point of view, but that did not have a great success, apparently for the sole reason that it contains too much of geometry for the musician and too much music for the geometer. From his Eulogy of Leonhard Euler, read at the Imperial Academy of Sciences of Saint Petersburg (23 Oct 1783). Published in 'Éloge de Léonard Euler, Prononcé en Français par Nicolas Fuss'. Collected in Leonard Euler, Oeuvres Complètes en Français de L. Euler (1839), Vol. 1, xii. From the original French, “Un des principaux délassements d'Euler était la musique, et en la cultivant il y apporta tout son esprit géométrique; … il accordait à ses recherches profondes, il composa son Essai d'une nouvelle théorie de la musique, publié en 1739; ouvrage rempli d'idées neuves ou présentées sous un nouveau point de vue, mais qui n’eut pas un grand succès, apparemment par la seule raison qu’il renferme trop de géométrie pour le musicien et trop de musique pour le géomètre.” English version by Webmaster using Google translate. Science is the labor and handicraft of the mind; poetry can only be considered its recreation. As quoted in Nathaniel Holmes, The Authorship of Shakespeare (1867), 198. Footnoted as Int. Globe, Works (Mont. ), XV. 150. When he had a few moments for diversion, he [Napoleon] not unfrequently employed them over a book of logarithms, in which he always found recreation. In Napoleon Bonaparte (1904), Vol. 1, chap. 10.